Blood thinner multidistrict litigation nears resolution. Court orders identification of eligible plaintiffs for settlement program. A $775 million settlement has been reached between the manufacturers of the prescription brand-name blood thinner, Xarelto®, and patients who have alleged bleeding injuries caused by their taking the drug. According to press statements by Bayer Healthcare, Janssen Pharmaceuticals Inc. (a subsidiary of Johnson & Johnson), and counsel for the Plaintiffs’ Steering Committee for the federal multidistrict litigation relating to the drug, the agreement will resolve the entire litigation of claims in the United States, including cases in federal and state courts. 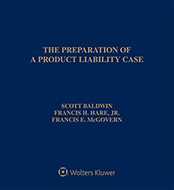 Bayer and Janssen do not admit any liability (In re: Xarelto (rivaroxaban) Products Liability Litigation, Fallon, E.). Xarelto litigation. Over 25,000 lawsuits have been filed by Xarelto patients who have alleged injuries, including internal bleeding, stroke, and death. These lawsuits claim that the manufacturers of the blood thinner "downplayed [the drug’s] risks and aggressively marketed [Xarelto] as an alternative for warfarin in patients who require blood thinners to avoid dangerous clots." The complaints allege that doctors and their patients were not fully informed of the risks, which allegedly resulted in life-threatening complications. Since the litigation began over five years ago, six cases have been tried, and all were won by the defendants. Proposed settlement. Under the agreement, a claims administrator and special master will be appointed to manage the claims process, as well as any appeals, and will be responsible for determining how funds will be allocated to those who are entitled to payment. Also, in addition to addressing lawsuits currently part of the multidistrict litigation, the agreement settles newly filed claims that meet certain criteria. Such filings include plaintiffs who had retained a lawyer to investigate Xarelto-related personal injury claims before March 11, 2019, register their claim by March 28, 2019, and file a civil action by April 4, 2019. The release by the Plaintiffs’ Steering Committee advises that individuals involved in these lawsuits should contact their personal attorneys to address eligibility. Furthermore, for any claimant whose first Xarelto prescription was on or after December 1, 2015, and/or whose first alleged injury caused by Xarelto took place on or after March 1, 2016, payments will be substantially reduced. In addition, payments are subject to a cap for claimants who were hospitalized for two consecutive days or less. Andy Birchfield of the Beasley Allen law firm and co-lead counsel of the Plaintiffs’ Steering Committee said, "This is a fair and just resolution for thousands of consumers who have substantial claims," and that "the guiding role played by federal judge Eldon E. Fallon" was appreciated. Also, Brian Barr of the Levin Papantonio law firm and co-lead counsel of the Plaintiffs’ Steering Committee noted, "… litigation like this is an important way for consumers to have a voice in matters of drug safety." According to a news release by Bayer, the settlement amount will be shared equally between Bayer and Janssen, and Bayer expects that its share will be partially offset by product liability insurance. Moreover, the companies have reserved the right to withdraw from the settlement if certain participation rates of eligible participants are not met. Bayer continues to maintain that the litigation "claims are without merit," but notes that the "favorable settlement allows the company to avoid the distraction and significant cost of continued litigation." The company also asserts that the drug’s "safety profile … remains positive and unchanged." In another press statement, Janssen states that it has looked closely at the multidistrict litigation’s allegations and found that the Xarelto’s label "clearly communicated [the drug’s] benefits and risks." The pharmaceutical company asserts that the plaintiffs’ claims about the drug "did not square with the facts," and that the drug’s U.S. Food and Drug Administration (FDA)-approved labeling "has always appropriately informed physicians of the information that they need to make treatment decisions with their patients." Even though the company believes the allegations to be meritless and in spite of its wins, Janssen notes the "enormous amount of time and resources" required in such complex litigation. The company states that it would rather spend resources on patient care than such litigation. News coverage of the litigation and plaintiff attorney ads to recruit clients to join the litigation "have caused confusion and concern among patients," which "can create barriers to the critical doctor-patient relationship and complicate decisions about treatment options." The company asserts that "[t]he consequences of this lawyer advertising can also be deadly," and attributes reports of deaths, strokes, and other injuries as a result of patients viewing such advertising and then stopping their prescribed blood thinner medications. The company expressed hope that with settlement, such attorney advertisements will decrease and allow doctors "the confidence to continue making the appropriate care decisions for their patients." Court orders. In order to coordinate the final settlement with state proceedings in California and Pennsylvania, the court noted in a March 25 order that it was necessary to identify all filed and unfiled Xarelto-related claims. Therefore, the court ordered that attorneys must identify all clients with such claims, regardless of a client’s eligibility to join the settlement, or decision to join the settlement; and must provide certain information to the court by court-ordered deadlines. In addition, pro se plaintiffs must submit a pro se registration form to the claims administrator within 30 days of the order. Another March 25 case management order outlines obligations of plaintiffs who do not participate in the settlement program and plaintiffs who are not eligible to enroll in the settlement program. The case is No. 2:14-md-02592 (MDL 2592). Attorneys: Gerald Edward Meunier (Gainsburgh Benjamin David Meunier & Warshauer) and Leonard A. Davis (Herman Herman & Katz LLP) for Plaintiffs Liaison Counsel. Andy Dow Birchfield, Jr. (Beasley Allen Crow Methvin Portis & Miles PC) and Bradley D. Honnold (Goza & Honnold, LLC) for Plaintiffs' Steering Committee. C. Gibson Vance (Beasley Allen Crow Methvin Portis & Miles PC) and Daniel N. Gallucci (Nastlaw LLC) for Federal-State Coordination Committee. James B. Irwin and Kim E. Moore (Irwin Fritchie Urquhart & Moore) for Liaison Counsel for Defendants. Steven J. Glickstein (Kaye Scholer LLP) and Susan M. Sharko (Drinker Biddle & Reath LLP) for Defendants' Lead Counsel.